Search engines use a technique called behavioral search to customize a results page based on your previous search behavior. However, you might want to opt out of personalized results for a few reasons. One reason may be privacy concerns. Another is that when you’re evaluating keywords and doing SEO research, you definitely don’t want the results you see to change based on your personal information. You want to see the results that show to most people, most of the time. To turn off personalized search for a particular query, just add &pws=0 to the end of your search results page URL. 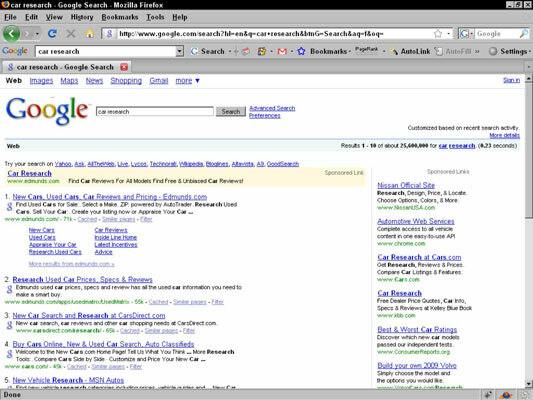 For example, after running a search for coffee mugs on Google, type &pws=0 at the end of the URL in the navigation bar. These few extra characters appended to the end of your search string stop Google from personalizing your results. Opt out of session-based personalization. A Google search results page showing customized results. Recently, Google began making it more obvious when your search results are customized by displaying the message Customized Based on Recent Search Activity near the upper-right corner of the window (see the above figure). If you click the adjacent More Details link, you see a page explaining why your results were customized, and offering you a way to see your results without these changes. Unfortunately, clicking this link for every search is something of a pain, but it is another option. Google’s Web History feature only tracks you while you’re signed in to your Google account, so if you sign out, it’s turned off — until you sign on again.